Hey, cynics – need to add spice to your verbal demolition of teen climate change activism today? How’s this: the author of one of the most definitive studies on personal responses to global climate change (the 2017 report by Professor Kim Nicholas of Sweden’s Lund University) concluded the most effective way for any individual to reduce his or her carbon emissions was this – have fewer children. Throw that in as an anecdote as you mock the fact that today, in cities across the world, pre-teens and teenagers are downing pens to stage the biggest protest to date in their so-called ‘Fridays for Future’ series of climate action demonstrations. The Irish primary and secondary school children who are expected to congregate outside the Dáil at lunchtime today are determined to make the grown-ups see just how seriously they take the clear and present danger modern life presents to the environment. In reality, two prevailing adult responses appear to dominate. The first is dismissal. Most of them are in it for the break from school, this line runs. And how many of them will get a lift to the Dáil in their parents’ gas-guzzling cars? Where will they go on their Easter break? Might there be planes? The second more or less tracks the response from Taoiseach Leo Varadkar, who declared himself “inspired and enthused” about today’s march – while continuing to preside over a Government policy that has sidestepped the need to act on the topic of carbon tax. This reaction is understandable, in many ways. We are used to finding our kids somewhat mystifying and peculiar. We like an opportunity to praise them. But then modern teens are usually synonymous with a whole pile of angst – about their obsession with games like ‘Fortnite’, or apps like Snapchat, or their binge drinking on Junior Cert results night, or their mounting anxiety levels. And so something like a climate change protest shines out to the elders in a manner reminiscent of the annual Young Scientists exhibition – a display of laudable if ultimately not all that important – joyous idealism. Look at them with their placards and their earnest expressions. Bless. Let them all have their day of protest and by Saturday it will all be forgotten and we can get back to the usual routine. Right? We may need to buck up our ideas. We all know, intellectually, that climate change is probably the greatest existential threat out there. We’ve all seen the statistics. We know we need to modify our own habits to make a difference (and buying a hybrid car is not the only answer) and we know we should force our industry and politicians into more responsible behaviour. The stakes are sky-high. Recent months have brought the grim news that the Arctic region is warming faster than anywhere else on the planet, with ice melting at a catastrophic rate. And yet we prevaricate. Maybe when it all hits our pockets hard, we’ll react. The Governor of the Central Bank, Philip Lane, recently named climate change as a strategic priority for the whole Irish financial system, such are its potential risks to our economic stability. Just this week, the deputy governor of Australia’s central bank chimed in to say global warming has created risks for Australia’s financial stability in all sorts of ways – affecting future insurance premiums, legal exposure for polluter companies and all kinds of future asset valuations, for businesses and households. Perhaps the problem is that with so many competing urgent threats to worry about – between Brexit, Isil, cyber-espionage, Trump, Korea, China, Russia and all the rest – we simply struggle to focus on what seems like it might not happen for decades to come. Instead we mock, or ‘ah bless’ the kids to oblivion. Have we that right, though? When were we last on a demonstration? About anything? One thing is sure; while we adults have been busy thinking about everything but the planet, a laser-sharp focused brand of teen activism has been on the rise for more than a year. It probably began when February 2018’s tragic school shooting in Parkland sparked a protest borne out of American teens’ very real fear for their lives due to gun violence. After most mass shootings in America, the media focused squarely on the killer’s or killers’ background motivation, supported by effusive expressions of “thoughts and prayers” for victims. Parkland survivors weren’t interested in any of that and they very savvily and effectively changed the story. A year on, the Parkland kids (many of whom have turned 18) have some real victories to proclaim. True, the sheer might of the US gun lobby has blocked any dramatic policy alterations in Washington, but the National Rifle Association has lost several lucrative corporate tie-ins as a result of the protests, and several states have tightened their gun laws. The campaign continues and its approach is often cited as a blueprint for climate change activism. In fact, one of Parkland’s instigators, David Hogg, made headlines in recent weeks when he dismissed US Republicans’ approach to climate change as more “thoughts and prayers”. BACK in Europe, an unsmiling young Swede called Greta Thunberg is setting an interesting tone for her growing legions of followers. 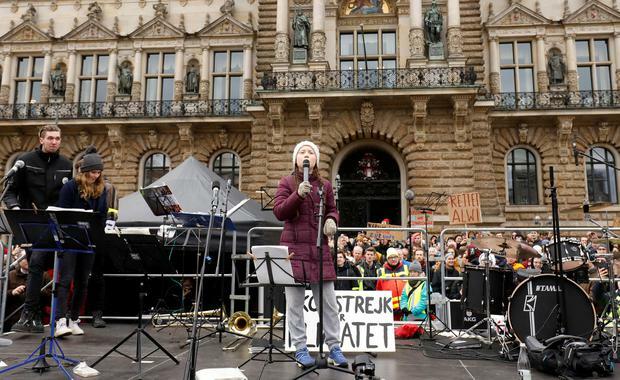 Thunberg is the teenager who kicked this whole protest era off when she staged a solo sit-down outside the Swedish parliament last August. She’s since been feted and interviewed over and over by a fawning world media, but her quotes make very clear that she’s not one bit impressed by the glamour of it all. It looks as though these marching youngsters don’t need our approval and they definitely deserve more than our scorn. They are justifiably angry and that’s neither silly nor cute – it’s serious. Madchild Game – Are you able to solve the puzzle?